1. This is a user experience based review. 4. Minimal post-processing applied to the images. Only slight tweak of brightness/contrast and minor adjustment of white balance for better overall consistency. This blog entry is a continuation from the previous entry: Part 1 of Olympus M.Zuiko 75mm F1.8 Review. If you have not read the Part 1, kindly do so here. 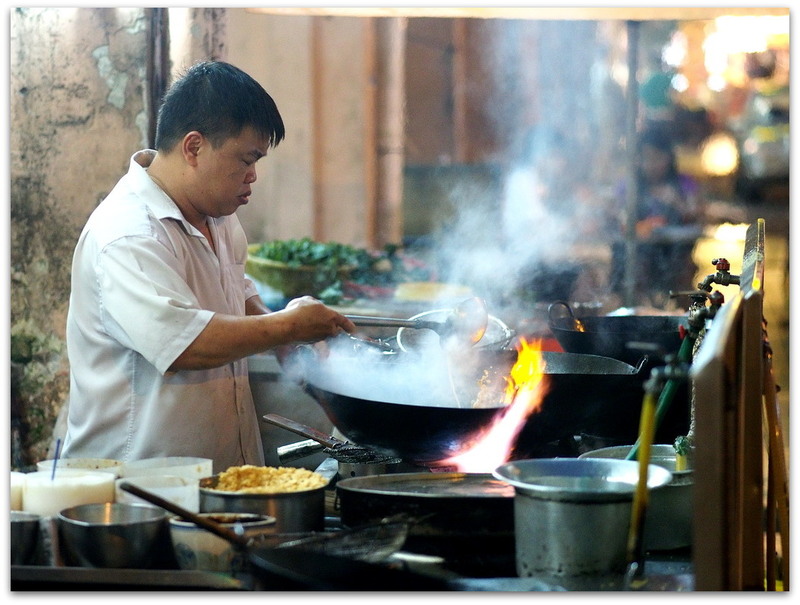 In the Part 1 of my review, I have brought the Olympus 75mm lens out for street shooting in Pudu, Kuala Lumpur, where majority of the shots were taken under abundant and good amount of light during early morning in the open air wet market area. In that shooting session, I have also found that the 75mm F1.8 lens is remarkably sharp even being used at wide open F1.8, and can produce admirably creamy and smooth bokeh (background blur). The 75mm F1.8 lens was tested at its optimum performance in terms of resolution and sharpness at mostly ISO200 settings, yielding best possible results under favorable natural available ambient lighting condition. What if we reverse the situation, and bring the lens out shooting in the dark? That is precisely what I am doing in this Part 2 of my Olympus M.Zuiko 75mm F1.8 review. 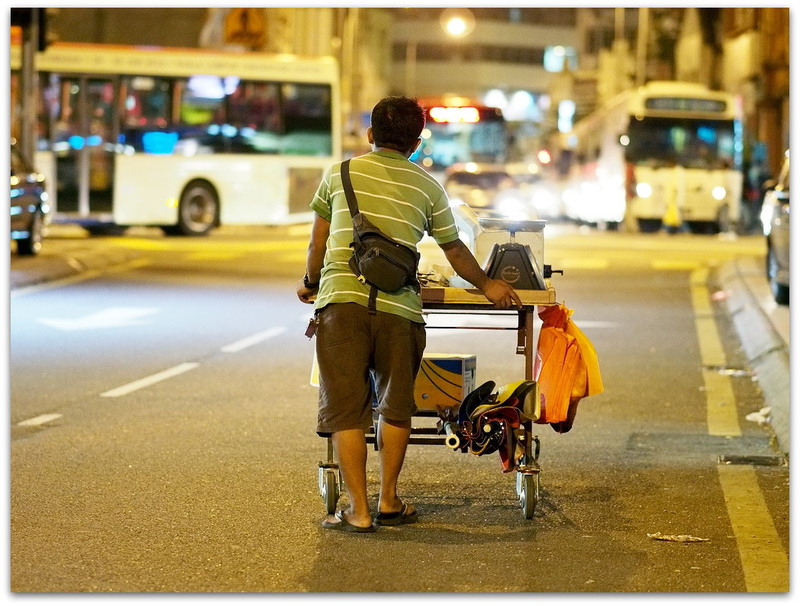 I have brought the 75mm lens to Petaling Street, Kuala Lumpur for night shooting to test how the lens perform under street lighting condition, where I needed to boost up the ISO settings to compensate for the lack of available light. 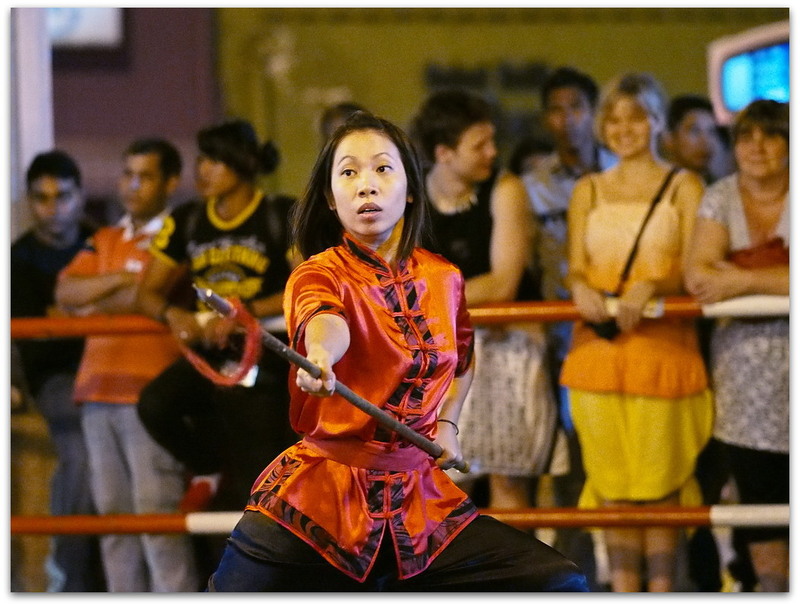 While I was walking along Central Market (just opposite Petaling Street night market) I chanced upon live Chinese Kung Fu demonstration, which was performed free for the public !! Yet another fabulous opportunity to put this 75mm lens to test. As a reminder, and a note to first time visitors, this review will be written from a photography-enthusiast’s point of view. This will be a user experience based review, sharing on what I think and feel using the M.Zuiko 75mm F1.8 mounted on OM-D E-M5 in real life shooting situations. Therefore, this is not a technical review as there will not be elaborative technical explanations, such as explanation of corner softness, optimum aperture range, chromatic aberration and so forth. In addition to that, I will not be doing direct side by side image and performance comparisons with other lenses. What I am presenting in this entry is merely what I can do with the Olympus 75mm F1.8 lens for my usual shutter therapy session. Take note of the motion blur in this photograph, it was not intended, as I saw the man made a sudden jump over the fence, I pointed the 75mm lens and made a quick AF, snapped the shot and realized the shutter speed used was too slow at 1/30sec. Though there was motion blur, you can see (from the lines of the guard rail) that the image was perfectly in focus. 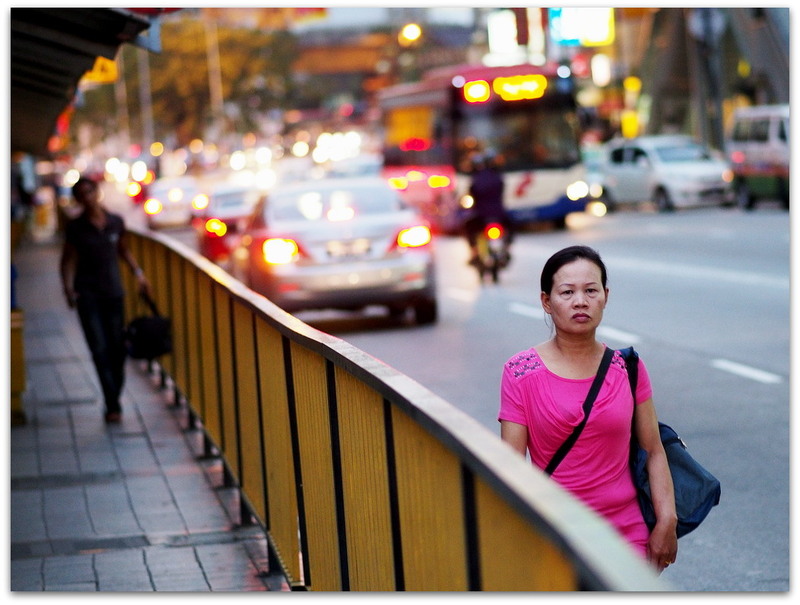 This shows how fast and reliable the 75mm focusing is, for quick reflex shots such as this one. I started shooting while there was some evening light available, but as the night progressed I have stumbled into some shooting situations where I needed to push up the ISO to 6400 to achieve sufficient shutter speed. The Olympus 75mm F1.8 performed flawlessly in determining the focus each and every time, quickly, and very decisively. There was no hunting encountered, and the lens just snapped in focus very quickly without hesitation. Coming from the stellar newer AF lenses line-up from Olympus Micro 4/3 lenses lately (such as the 12mm F2 and 45mm F1.8), I am expecting no less from this new 75mm F1.8. For stealthy reasons, I turned off the red beam AF assist light on the body, because while shooting in the dark the last thing I wanted to do was to alert my subjects with that annoying red beam screaming out in the dark. There is nothing to find fault about in this lens' autofocus performance, it just worked, and worked very efficiently. Considering the fact that I was dealing with narrow depth of field due to the large aperture of F1.8 at 75mm, the accuracy of the autofocus being determined at such blindingly fast speed was really impressive. You just click it and it instantly snapped into focus. 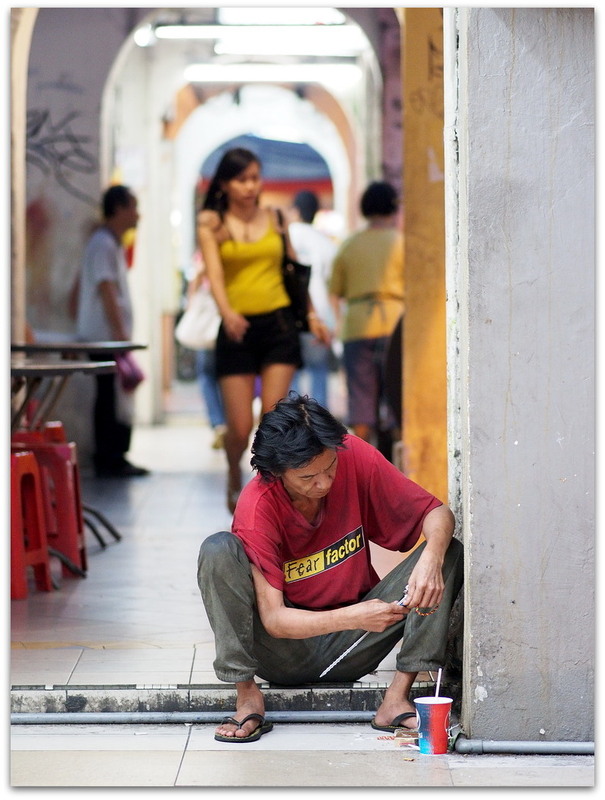 To torture the autofocus, I chose a scene in the backalley where there were two people walking towards me from afar. The lighting was so dim, even at ISO6400, F1.8, I managed to get about 1/50sec of shutter speed only, which was good enough to freeze the slow walk. I fired a couple of shots, and all of them came out perfectly in focus. Believe me, I have used many DSLR bodies, from many different manufacturers, in such challenging condition, shooting with a focal length longer than 100mm (on 35mm format) will have your lens at least struggling a little bit before locking on focus. I am truly glad to see Olympus micro 4/3 system, the 75mm lens in combination with the capabilities of the new E-M5 has made shooting in such difficult situation, a breeze ! The Dark Backalley. This was the shot I was referring to in the previous paragraph. Handheld shot taken at slow shutter 1/8sec, shooting with the 75mm, again, I was reminded on how remarkable the 5 Axis Image Stabilization is inside the E-M5. Alright, so far we all know how wonderful the Olympus 75mm F1.8 lens is, and I have described on all the positive points and why I like about the lens. Now lets move on to the part where I wish the lens could have been improved. So what could have been better? This 75mm lens has very poor magnification factor, hence you will not be able to achieve any decent close up shots at all. Minimum focusing distance is about 0.84m and that itself is very restrictive for many close up shooting, which unfortunately is something I love to do a lot. I like to be able to get close to my subjects, and I am not expecting near macro capabilities, but Olympus lenses, even the cheaper kit lenses have always come with very admirable close up shooting ability. On the 75mm lens, the rated magnification ratio is 0.1x, and I wish somehow the lens could at least achieve 0.25x magnification, and have a closer focusing distance of maybe half a meter away, instead of nearly a meter. The 75mm F1.8 lens is not exactly a big lens, in fact I do think it is decently sized, and the weight is justified due to the all metal construction. Having the 75mm fitted on Olympus latest OM-D E-M5 body plus the battery grip, the lens felt right at home, as if it was tailored made to be used particularly for the E-M5 system. Nonetheless, we all know how small and light the rest of the micro 4/3 bodies are, including both from Olympus and Panasonic bodies. Smaller bodies such as Panasonic GF series or Olympus E-PM1 might not give you the comfort and balance of handling the 75mm lens for long shooting hours. I know many photographers have some soft spot for bigger and heavier lenses, with all metal construction, but in practical usage, balance and handling are more important when you are out there to get results. For many of you who have the smaller micro 4/3 bodies, please do yourself a favor and try the lens on the body first before deciding to buy. I have shared my thoughts on the 75mm focal length in my Part 1 review of this lens, but I have to say again that the 75mm focal length may not be suitable for the majority of photography applications. It is a case of "neither here nor there". It is medium tele-photo range lens, but it certainly does not have the reach of a true tele-photo lenses that shoots animals, birds, or concert performance from far. It is longer than usual prime lenses for comfortable shooting uses, and I admit it is even longer for comfort for general street shooting. If you want this 75mm focal length, you have got to know what you are getting into, and you must know what you are doing to do with this lens. I would say for certain style of street shooting, this lens works wonders, being able to shoot from far and allowing you that extra working distance between you and your subjects. 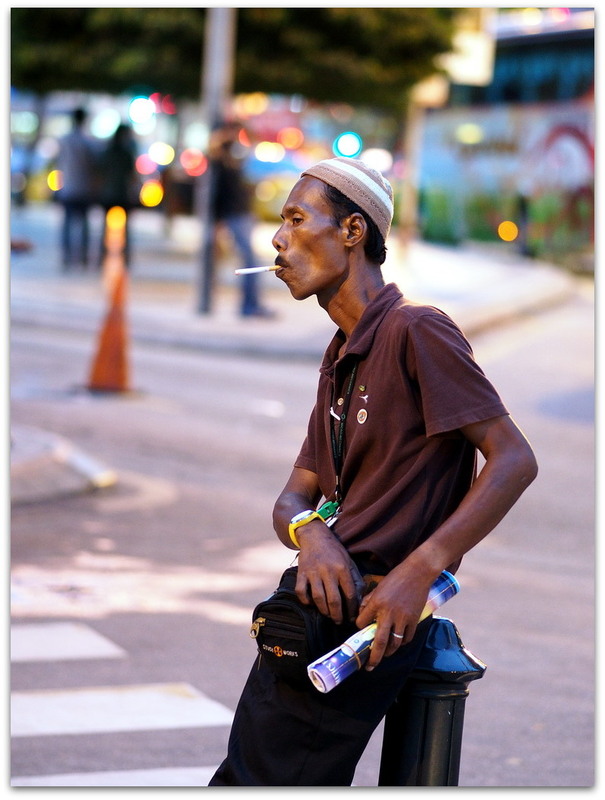 Be warned, most professional street photographers would suggest you otherwise: go wider. If shooting portrait is what you do most, I am very sure this 75mm lens wont disappoint. You will however, need to take that many steps backward to get what you needed to fit into the frame. By now, we all know Olympus placed the 75mm F1.8 in their so called "premium" lens category, sitting together with the earlier 12mm F2 which was released about a year ago. This is not a lens easily recommended to anyone, considering the hefty price tag, but if you do need the lens, and it does what you do in photography, it will be worth your money spent. For the budget conscious crowd, such as myself, it is difficult to justify spending so much money for a prime lens with a focal length which is not my main choice of usage while shooting. 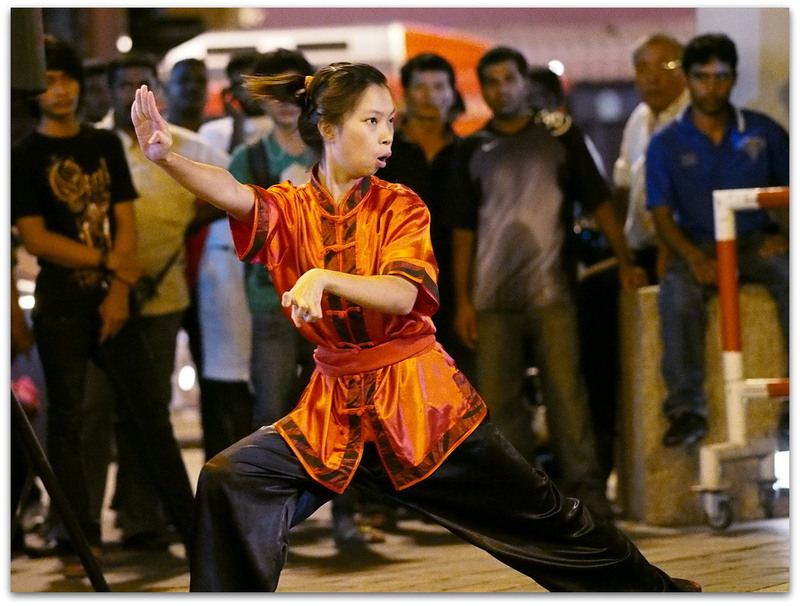 As I was strolling away from Petaling Street toward the Central Market area, I found out that there would be a Chinese Kung Fu live demonstration by local Kung Fu Artists happening right in front of Kasturi Walk entrance. This was the exact same place where the traditional Malay dance took place which I shot for the earlier Olympus M.Zuiko 45mm F1.8 review, which you can find here (click). I thought to myself, what a perfect opportunity to do the ultimate lens torture test ! 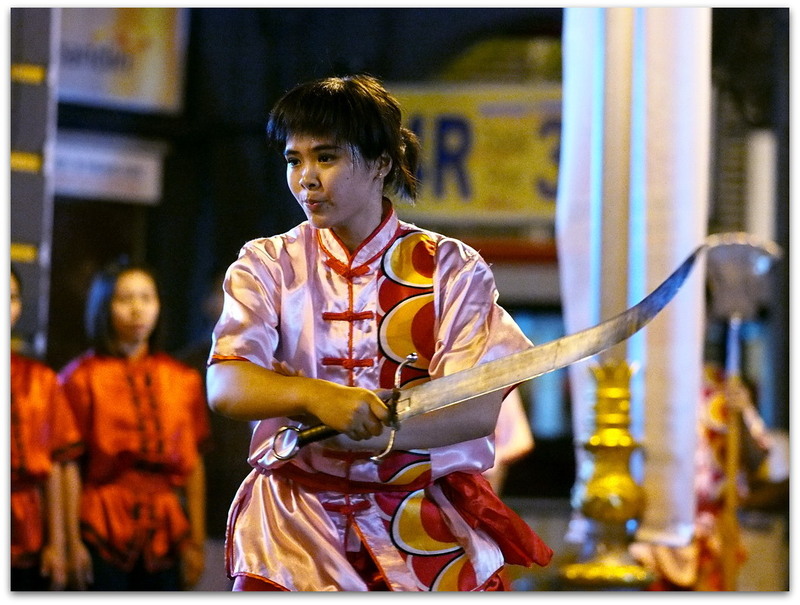 Think about it, extremely fast action shots, in dim street lighting, how much worse can it get? The ODD 75mm Focal Length, Again. Just before the show started, I had to decide where to position myself. I realized that the front line was actually too close to the performers, and I wont be able to get decent full body shots in action. If I did not go to the front line, I might get blocked by people in front of me, which would have been a no-no, since getting clear shots with nothing in my line of sight was my priority. After some quick thinking I decided to just stay at the front line and did what I could with the 75mm lens. In that moment, I knew very well that the 75mm lens was not the best suited lens for the job, and the right lens was obviously the 45mm F1.8. Nonetheless, I was there to test the 75mm lens, and I did manage to get some shots out of it. You see, the problem with 75mm is being so tight, I have very difficult time framing my subjects. 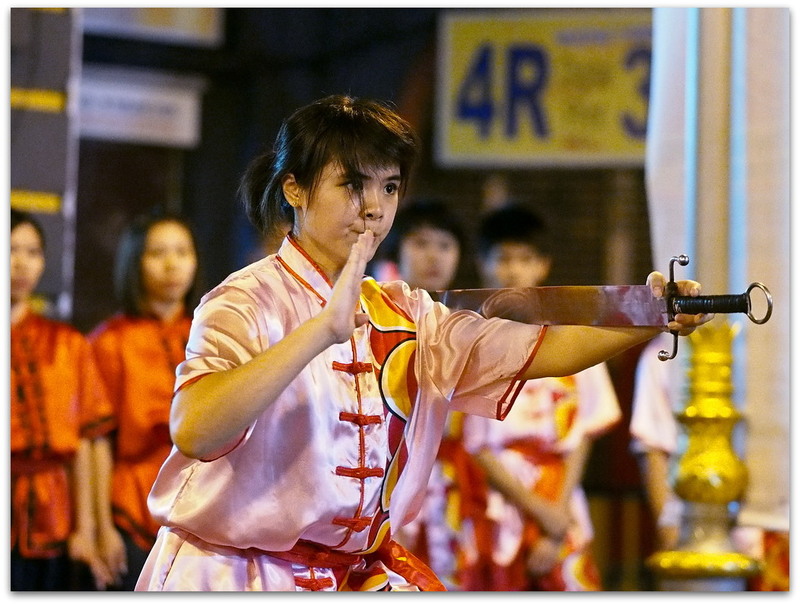 Since it was Chinese Kung Fu that I have no background or knowledge besides what I see on TV and the movies, I could not predict their movements, which can change, and go all around the place. Tracking the movement of the performers at such telescopic view was not easy at all, and I did have a lot of misses, either I accidentally cut off their head in my composition, or the performer already jumped out of my frame completely. However, on the positive side of things, with the 75mm, the view I get from the lens was VERY close to the performer, and the shots, when I nailed them, came out surprisingly pleasing, giving you the "in the face" impact. I set the camera to Aperture Priority mode, shooting at the widest F1.8 opening to gather as much light as possible. Initially I started with ISO3200, and I kept firing away without chimping, so that I can get as many shots as possible. I was using a slow SD card, rated at class 4 only, hence I could not do the 9FPS continuous burst shooting. I did single shot for all the images, but even so, after firing 10-20 shots successively, I find the card not being able to keep up with the writing speed. My fault for using such a slow and lousy card. Do forgive me, because the main card I use for my current camera system was CF cards for Olympus E-5. There was a very brief break in between performance, and I made a quick review on my images. To my horror, almost ALL of them were blurred !! Judging from the focusing I have seen from the Electronic Viewfinder while I was shooting I was very confident I got most of the focusing right, and it was then I realized the shutter speed was not fast enough to freeze action. 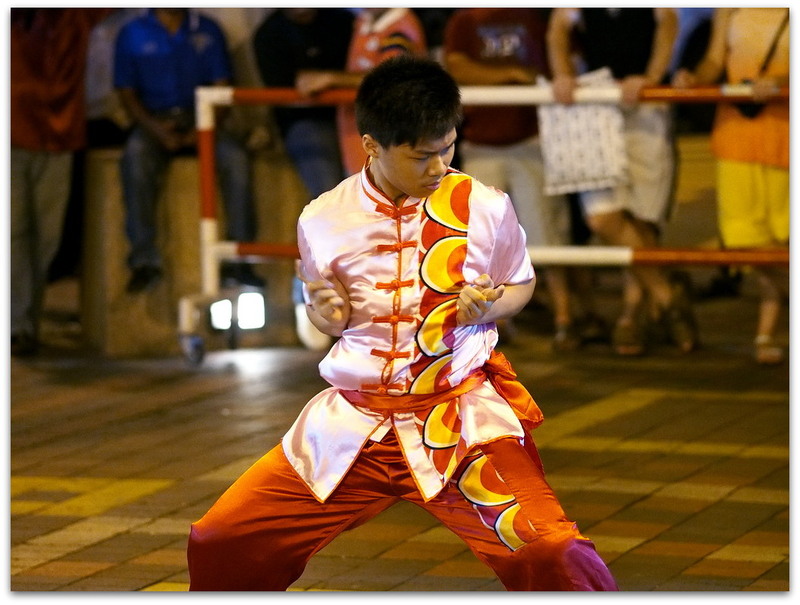 The Kung Fu movements were a lot faster and much more violent in comparison to the previous Malay Traditional dance I have reviewed for the 45mm lens. Not only that, somehow I did feel the lighting this time was dimmer than previously, and that left me with very little options to go on. I had no choice but to push the ISO setting to 6400, to achieve at least 1/250sec or faster, so that I can capture the performers with less motion blur. I did not intend to push beyond ISO6400, we all know what the results would be, which would be pointless for any meaningful photography tests. I refrained myself from using the continuous focusing or tracking, because I knew from experience it would not work well enough for extremely fast action shots. Therefore, I used Single-Autofocus, and relied on the camera and lens' ability to instantly lock focus and snap right away with minimal delay. This technique worked, but due to extreme fast movements, I did have a lot of failures too, about 50% of the shots were out of focus. The one clear cause of this problem was me being too close to the performers, as I have mentioned earlier, and the hit rate will surely improve if I was a few meters back from where I was standing. I did not have that flexibility to work with, hence I just did what I could with the limited 75mm field of view. Another reason was due to the impossibly fast movements of the performers. 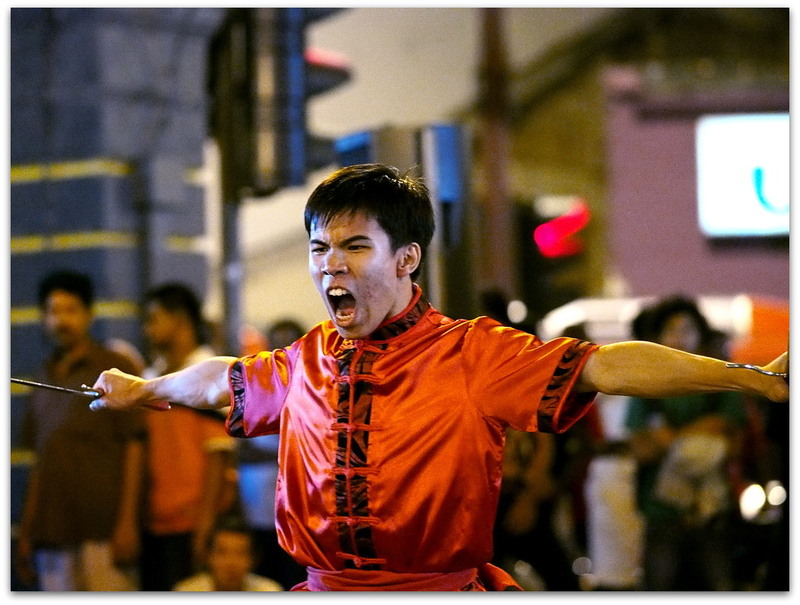 Seriously, Chinese Kung Fu cannot be slow, if it was slow, it was not kung fu !! That itself is good enough reason for making the 75mm's test a miserable situation. I would say having 50% keepers is very, very good indeed considering how challenging the circumstances were. If we just take a few steps back and really think everything through, it is very evident that the Micro 4/3 system has come a long way. The usability and capability of the system, both the camera bodies and lenses have been improving to an extent that the system has become a promising choice and direct competitor, even to professional DSLR system. Micro 4/3 may not surpass DSLR in certain aspects, but having such blazingly fast autofocus, in combination with continually improving image quality, yet being offered in much smaller and lighter package is making the system such a compelling alternative. 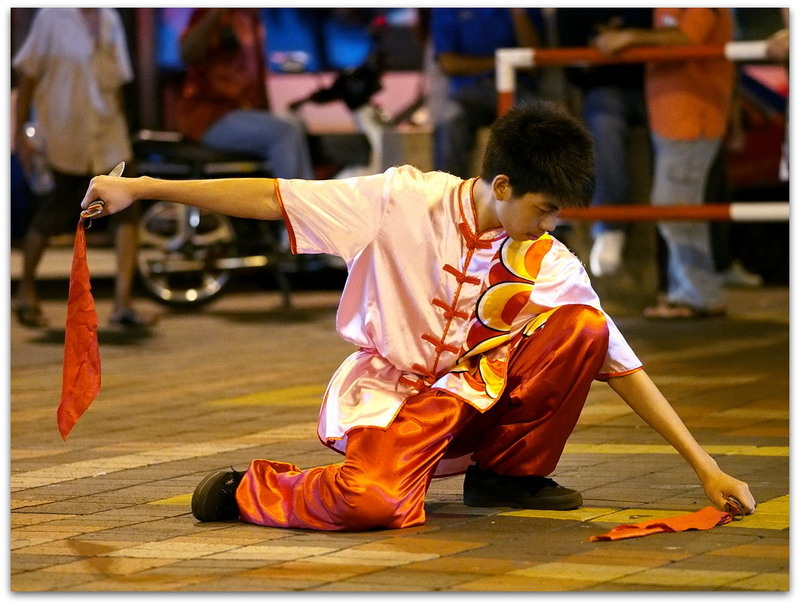 If I was given a task to photograph the above Kung Fu performance with my current working system E-5, I might not be able to deliver results. I dare not go that far beyond ISO1600, and for the original 4/3 DSLR system the native lenses has widest aperture of F2 only. On top of that, the F2 lenses do not have as quick, or as accurate reliability in terms of autofocus, in comparison with newer Micro 4/3 body and lenses. Come on guys, rewind 2 years back, who would have thought we will be able to shoot usable ISO6400 on a great F1.8 lens with near flawless Autofocus even in challenging lighting condition? To me, practicality is very important when it comes to camera and lenses. 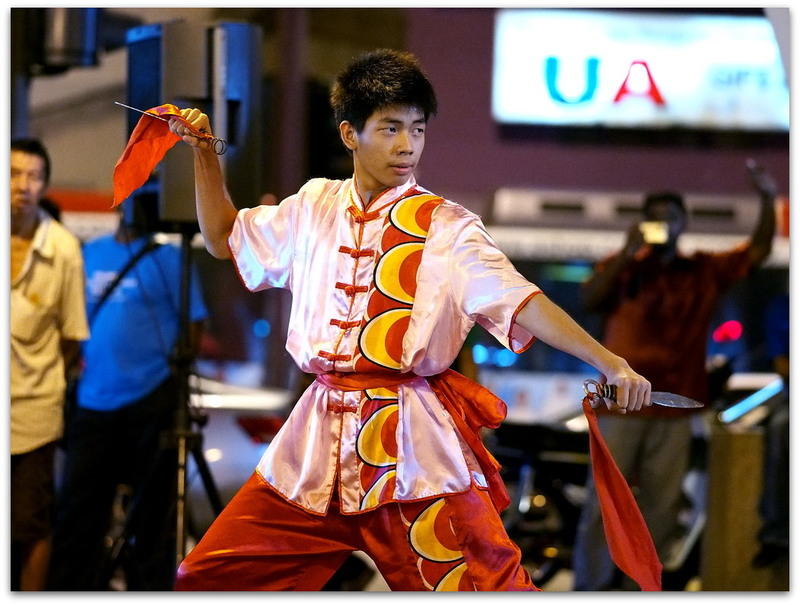 This particular Kung Fu performance shooting made me realized that the micro 4/3 system has far surpassed the original 4/3 DSLR system. You may not agree with me, I also think that the micro 4/3 system is no longer lagging behind APS-C Sensor DSLR competitors, and it is moving toward to be on par with full frame capabilities. Bold claims, true, but we know the whole micro 4/3 system is still evolving, I am just thrilled of what future possibilities it could bring. The only question now is not how, but "when". 2) Extremely sharp, even used at wide open F1.8. Possibly the sharpest Micro 4/3 lens, and one of the sharpest lenses around in the planet. 4) Minimum focusing distance could be better, for close up shooting. I shall not be providing full size JPEG images for this shooting, since the photographs were all shot at high ISO setting, and may not be representative on what the true image quality the lens is capable of. This Part 2 of review is all about how the lens handles shooting condition in unfavorablly dim lighting, and catching up with fast action movements. I also believe I have provided enough samples in my Part 1 for your pixel-peeping pleasure. Olympus M.Zuiko 75mm F1.8 lens will give you extremely sharp images, with very admirable bokeh quality and performs very well in autofocus. If you need the 75mm focal length, do a lot of portrait shooting, and know what you are doing with a 75mm focal length, this 75mm F1.8 lens will make you a much happier photographer. If you have found this review useful, kindly purchase Olympus M.Zuiko 75mm F1.8 lens from B&H (click here). Agreed Dreamie. Who would have thought we can do ISO6400 on an Olympus, even just a year ago? Very much improved compared to the first EP1, EPL1 on mirrorless tech. Not to mention getting more and more yummy fast prime lens as it goes. Andy, agreed !! The system has indeed mature a lot. Micro 4/3 has come a long way. Another great review and photo. I think the 75mm f1.8 is a good lens. Thanks Kelvin! It is a good lens indeed. * Pekka Potka talks about his favourite focal length, 35mm, and how he is so familiar with it that he immediately walks to the correct position and can shoot with perfect framing. I would guess it is possible to get to know the 75/1.8 in the same way. * I understand the problem of using it in street performances, where the crowd gathers closely around the performers, and how the 45/1.8 may be a better choice. But I would guess that when the performers are on an elevated stage, the 75/1.8 may be wonderful -- in particular if you are not sitting in the front row. Thanks for the kind compliments !! Agreed the 45mm F1.8 minimum focusing distance is not great, I did mention that in my 45mm review. I guess it is just my own preference, I want to do some close up shooting with whatever lens I have. Getting used to 150mm field of view is a lot more difficult in comparison to 35mm or 50mm classic standard focal lengths. but the 75mm F1.8 lens does have its place, as you have mentioned for stage shooting. Most of the time we do not have the luxury to be at the front row, and standing behind few rows, the 75mm is just perfect to get close. I really don't understand the complaining about MFD on these lenses. Compared to a comparable lens for any other system, they focus EXTREMELY closely for non-macro lenses. The 45mm f/1.8 focuses to .5m, which is a little longer than the 'average' 50mm lens for full frame cameras, but it's with a much tighter field of view. If you compare to lenses with similar field of view, i.e. an 85mm lens on full frame, the 45/1.8 can focus MUCH closer and get much tighter shots. The canon 85mm f/1.8 focuses to 0.85m. You're getting far better close focus performance than a full frame body with this lens. Thanks Jordan for the comments and feedback. I guess I come from Zuiko DSLR lenses where most of them have very good close up shooting capability, and decent magnification of at least 0.25x or more. If you have done such comparison with other manufacturer's equivalent offer of lens options, it does seem Olympus has done their best to surpass the minimum focusing distance. Good point you make there. thanks for this, as usual, deep and well documented review, Robin. The way you are "torturing" the hardware help a lot when considering that we have to "take pictures" and not "comparing resolution charts". Based on your first review, I pre ordered this lens one week ago, and now can't wait ...mainly for show, music or theatre shootings. Thanks Yeos for the kind words !! For show, music and theatre, this 75mm seems to be just right ! Great review on the lens with awesome images. Love it. Actually I am waiting for your night shots as I have a lot to learn in night shooting. Good evening and Happy Shooting. Thanks again for your kind support, and your compliments. Night shooting is not easy, I too constantly struggle with that. When the lighting is poor, everything suffers for photography. I know that in a way these are just test shots but you are also a great photographer. My wife, who has never been a big fan of street photography, has been forced to re-evaluate her position. In the past her complaint was that street photography seemed only gritty and mostly depressing. She has been looking at your work for a while now and is beginning to wonder if she can ever consistently take pictures as uplifting, respectful and beautiful as yours. She is so stubborn that I have to give you the highest marks for changing her mind! Speaking for myself I have really appreciated your OM-D and m4/3 reviews. I will buy an OM-D later this summer so please mention to the Olympus folk that you have made a sale for them. Thank you so much for such kind words !! I am a learning photographer, I would not say I am there yet, but hey, the whole journey counts. I am very glad to hear that your wife has warmed up to street photography !! Street shooting is fully depending on your own vision and take on life, if you see things miserably and depressing, that will be the outcome of your photographs. Since your wife hates that, she can choose to have more positive outlook, and I am sure that will shine through her photos as she took them. I am sure Olympus system will be right at home with you and your wife. Happy shooting and be sure to make beautiful photographs ! Great review! To put your results in shocking perspective: It happens I recently photographed a community concert band rehearsal inside a church. I used a 135mm F2 of stellar reputation. I shot at 6400 most of the time. I put ISO on auto while selecting a 200th to a 320th and f2. So our lighting levels seem to be equivalent. Our focal lengths equivalent. Our ISOs equivalent. RESULTS: Yours: spectacular! Mine: noisy as hell. The noise itself is very sharp, but the image isn't. All image sharpness is lost to high ISOs. Not fair to the lens which is sharper than sharp at lower ISOs on my current camera. So what camera was I shooting with: a D800 with the Nikon 135 F2! No, really a D800. My reason for shooting was to test the sensor at higher ISOs, I already know my lens is spectacular. Sensor: not-at-all at higher ISOs. What this tells me besides: I bought the wrong gear, is that NOISE performance of the sensor is at least 10 times more important than sensor resolution. Anybody dying for a D800? I have one I'd like to part company with. Thank you so much for your kind compliments !! Thanks also for sharing your experience with the D800, shooting an event with high ISO and similar setup. Nonetheless I do think that possibly there are a few other variables, and unless we really are both shooting at the same place and time, the comparison may not be very fair. I am sure D800 is a lot more capable than what you described !! However, it is refreshing to find the OMD and 75mm to be able to perform in such difficult shooting circumstances. Indeed, the practical usage of micro 4/3 system has really matured to a competitive level, rivaling even the professional level equipment. Thanks for the review Robin! No matter which camera or lens you try, your photos are always selling it. It was my pleasure to do the review ! Second TM's comment. If you WERE having problems capturing some street candids these photos virtually says otherwise. To distinguish I enjoy street "portraits" terribly similar to Smoke a Cigarette and Fear Factor and have used a tele on my now deceased 510, to accomplish that. The 11-22mm is simply my favorite toy and use it more for event work. Like TM said, you're selling it. It to me? It's a fine studio and street portrait lens! However, the more (to me anyways) you say the 75mm isnt street ready I find from your shots and reading between the lines it is for the daring few. So it would double as my main portrait and my other toy. Heh. Anyways I great review looking forward to the conclusion and the purple fringe issue you've experienced. Thanks so much for the kind comments, but I certainly think you were being too kind. Yeap, I will do one more entry (with some additional photos), and the purple fringing issue will be discussed, but it is not much of an issue really. I will not fully trust your review as yet, as your pictures are simply too beautiful. This looks like an advertisement (please, i mean this in a positive sense and i have well read your critical words too). Unfortunately, Pana doesn't create many primes with optical stabilisation, not even the 25/1,4. They are more concerned with creating one standard zoom version after the other. I guess you were right, we will never be satisfied with what we have, we will always be wishing for that thing that the camera is missing. The complain never ends, but you know what, these complains are the thing that drives the camera manufacturer to do their best and create the next best thing. If Olympus community did not complain so much in the past I do not think the micro 4/3 system is where it is today. Panasonic is a great system no doubt, but I do not agree with some of their decisions, one you have mentioned: not having in body Image Stabilization. That could have opened up a world of photography possibilities !! Great follow-up to part one Robin! 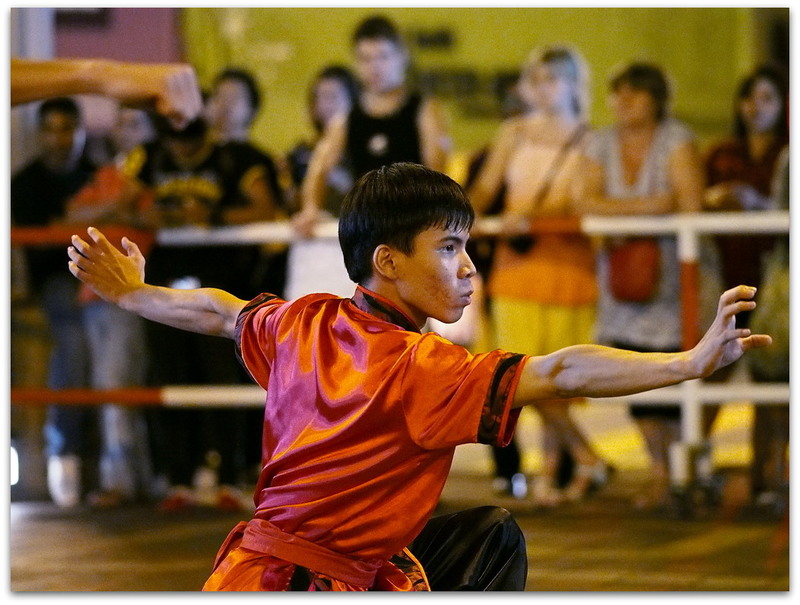 Even though you knew you didn't have the right lens for the Kung Fu demonstration you still were able to capture several great shots. Thanks for sharing your shutter theorpy sessions with us. Thanks for the kind comments !! I tried my best, and I think somehow it was luck (and a lot of the camera + lens capability) that made the shots happen. It was always a pleasure doing shutter therapy, and even better sharing them with someone out there ! Hi Robin, you're a great inspiration for me! I was wondering what autofocus settings you use on your EM5? Are you using mostly S-AF in these shots or the tracking? Do you have AF set to half-shutter or to another button? As I have mentioned in my write up, I used only Single Autofocus at all times, and used the default shutter button. Thanks for the kind words !! Robin, your photos are very punchy and I noticed that you do a little PP by adjusting WB and contrast. What processor do you use if you are processing in RAW? Why don't you simply make the contrast adjustments in-camera to save a step. Love your articles by the way and it is because of your wonderful series of photos on the 45 1.8 that I went out and bought that lens. Not sure I am quick to get the 75 even though I would imagine that it is as good or better than the 45. The photographs were already this contrasty out of the camera, I only adjusted the brightness/contrast balance a little for overall presentation (some images were a little underexposed, or overexposed, just minor adjustment for consistency sake). I really like your style of reviewing. In the first part you haven't dissapoint me with (as one of the few) showing some full body length shot and the amount of background blur in these kind of compositions with this specific lens. Thanks so much for your kind words, really appreciate it. and do come back for future blog entries, I share photos and thoughts, would really benefit from the sharing with one another with everyone here. Sometimes people can give very useful feedback, and point out my own mistakes. The best comment I received today was a knock from Jordan Steele (comment above) giving me feedback on my ridiculous expectation of minimum focusing distance. oh, I forgot to mention the frog shot with the dissapearing cage, which also was an eye-opener for me. Useful-information! In a review "useful" photo's I think is more important than a perfectly composed shots (which I am sure you are capable of doing). Your photo's oozes "fun" and ""not taking it too serieously"" then only showing the perfect shots. Thanks JohnC and yes enough flattery ahahah I do not deserve them seriously. Just doing my part and reporting whatever I thought the community would find useful in evaluating the lens. Glad that I could help in whatever small ways I can. Looks pretty serviceable at 6400. The noise characteristics of the Panasonic sensors really kept me away from m4/3 and we all know who makes the OM-D sensor now! With my Ricoh GXR (my only real digital system right now, I shoot MF film largely) I stick at 1600 and on the few occasions 3200. 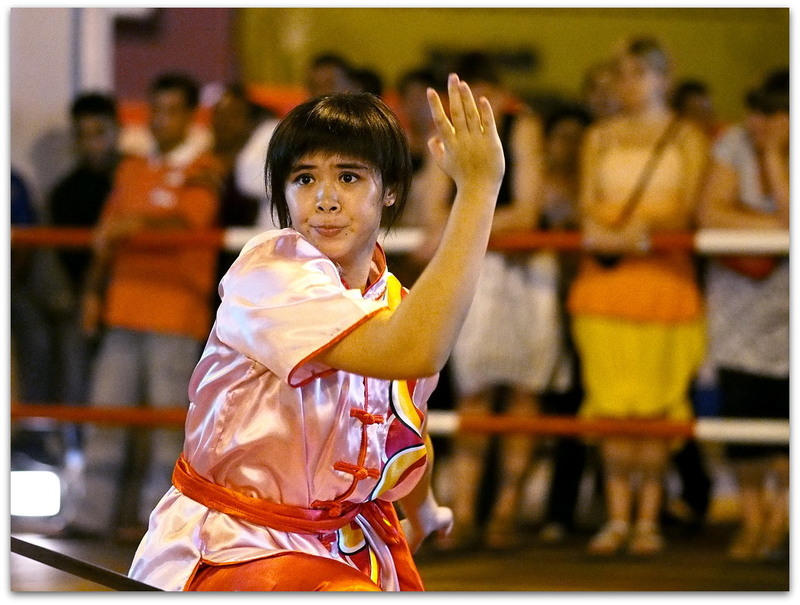 I didn't think you would need to punch that high for your action shots but I know how fast wushu routines can get! 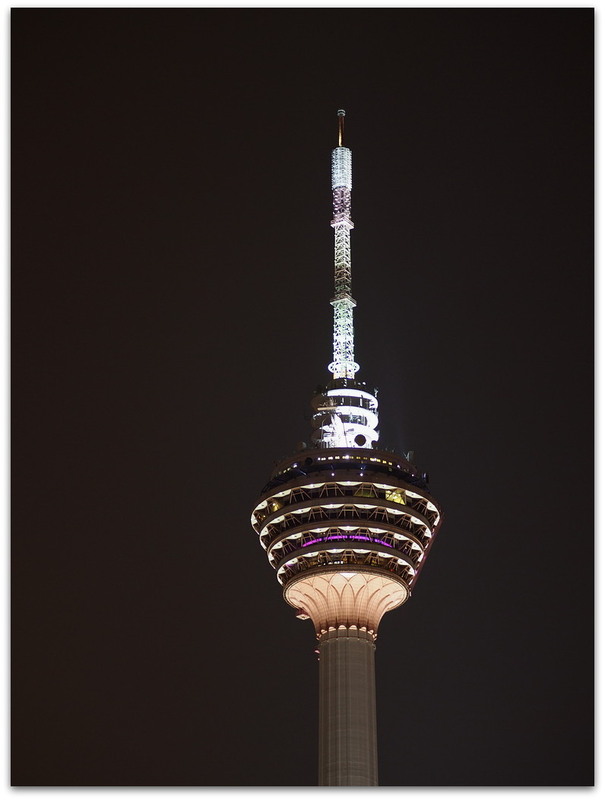 As an aside, that KL Tower shot is amazing. I've seen sharp examples at that shutter speed on other reviews but the night snap made possible by IS is the biggest sell for me. The only time I want to use a tripod is for Gigapanning. 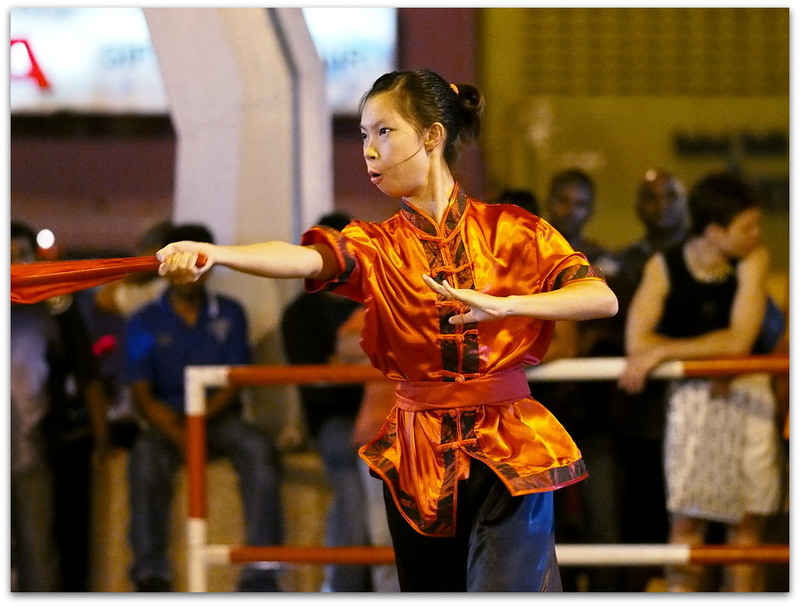 I think with a little bit noise reduction in post processing and careful sharpening will make those ISO6400 shots shine even better, Yes, those wushu performers were scarily fast. I was shooting at ISO1600 on the KL tower at first, then I thought the tower was not moving, and I was fairly confident the IS on E-M5 works very well, so I gave it a go! Thanks for the 2nd part. Somehow these beautiful images make me lust for this lens even more. Great review! Hope you could do a review for the Panasonic 12-35mm as well. 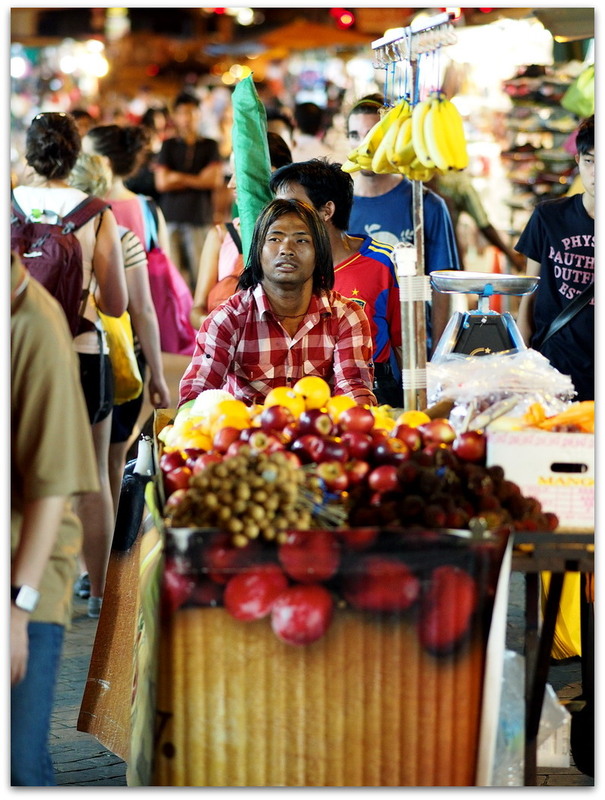 The reason why I can do this review was because Olympus Malaysia approached me and loaned me the 75mm. I have not been contacted by any other camera manufacturers. If they do find me, of course I would not say no !! Super razor sharp images indeed. This lens performs excellently even on low light. You're reviews are spot on my friend. You've made a lot of Olympus fans proud and even converted nay sayers to oly believers as well. Keep up the good work mate! You are being too kind, thanks so much for such kind words. The lens itself is fantastic, I only had to show the photos it took ! you have also put the Oly spark back in my eye, I’ve been a fan of Oly since the e300, had the e330, and then the e3, I moved to a Nikon D700 recently to get better low light performance that I was not getting with the Oly systems but man I’m really loving the OM-D atm. I really think Oly make some of the best lenses for digital cameras, so glad they have caught up on the low light issues they once had. now I just have to convince my wife I need a 6th camera in the house lol. (Steve huff linked this blog) if your reading this your a very bad influence lol. This lens indeed is a very good lens but I don't think I will be getting it soon because of the focal length. 2) Odd 75mm focal length, not for wide range of shooting needs. To me the best focal length for portrait is 85mm. no matter what field of view or sensor size you are talking about. Personal taste... no need to main attack. I would like to have a shorter minimum focusing distance. I read there are people compare 135mm having 1m focusing distance. This 75mm has half of the distance, it should have focusing distance around 0.5m. Zeiss 25mm can have .17m focusing distance. I think it is just the designer decision. I believe having shorter focusing distance will compromise on the infinity side. Anyway, I would like to have shorter focusing distance... that is a user requirement... no need to main attack again. If Olympus is thinking of typical user like me, they should consider to make this lens more versatile... maybe add the similar macro capability like the 12-50mm. Another one which I want to add to your cons side, is it doesn't have distance scale. Focus-by-wire sound good but a fixed lens should have distance scale and aperture marking on the lens. This is a requirement from a user like me. With all these, it is good enough for me to put off this lens. I will get the 12mm but not the 45mm and 75mm. Too bad... maybe I am a bit old fashion. Please leave a name the next time you comment. It is perfectly fine to have your own preferences and being old fashion, one size of shoes is not going to fit all sizes of feet. Different lens produced for different purposes, for different photographer's needs. There is no right and wrong. My nick is Anonymous... put it in short. the lens is a great lens. IQ is very good. A lens for this price it should at least same or better than 12mm. Unfortunately the departure of distance scale is really disappoint me. The fact that m43 is a 2x crop camera system. It should design the lens to focus closer. I don't mean it should be at macro standard. Hope you get my point. Anonymous is not a proper nickname. I have dozens of anonymous. The reason I asked for nick name is so that I can trace your history of comments, so I can remember you and relate to what you have said, rather than just forget who you are the next time you decide to comment. I hope you get my point too. I'm totally agree with you on the focal length of this lens. It's not my preference too. Thanks for reconfirming it. I would have no chance to try before buying it, if I want to get one. It is always prudent to try out the lens first before purchasing !! Thanks for the kind words. P/S If one day, I want to do the street shooting, I might reconsider this 75mm lens. It will give me more comfortable distance from the subject, just hit and run. Haha, I know it's a bad manner. For hit and run, I would say tele-lens work better !! Thanks again Robin, excellent review and shots, still the best by a wide margin from any review of this lens. Thanks so much for your kind remarks !! I tried, and I am glad people find my review helpful. Wow! Total Wow! The pictures, the lens, everything! Even more impressive than your very great 45 mm review! Thank you so much! Thanks Thorsten !! the reason is because the OMD is a better camera than E-P3, which I used to test the 45mm . Thanks for the kind words !! It is a very difficult thing to suggest which lens you need, only you would know best on what your shooting preferences are. Nonetheless, a zoom lens does have its flexibility, but at the same time, it does not have the F1.8 and will never be as sharp as a prime lens. 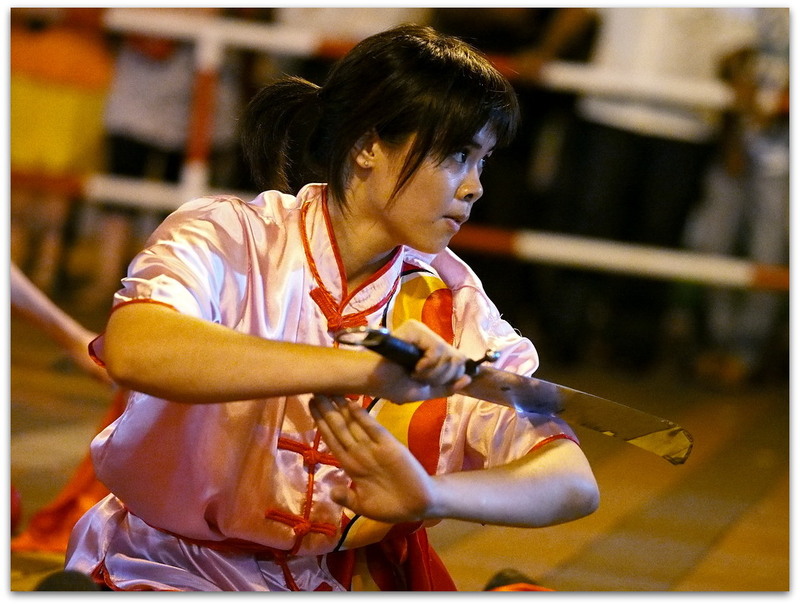 The kung fu pictures shows one of the advantages for shooting fast action in bad lighting like a stage show, concert, or sporting event. At those locations, you are usually farther away from the action so the 150mm reach will be very handy although maybe not long enough. Still, to get f/1.8 you can't complain. You can always crop. Thanks Robin for shooting in such diverse situations. Indeed, if you have a distance away, the 75mm F1.8 really works better, and looking at the amount of details it can capture, I am sure a little cropping wont hurt either. Robin, this two part lens (and camera) review was extremely well done, and provides the kind of "real world usage experiences" that I simply do not find anywhere else. Your photography is excellent, too. Thanks! 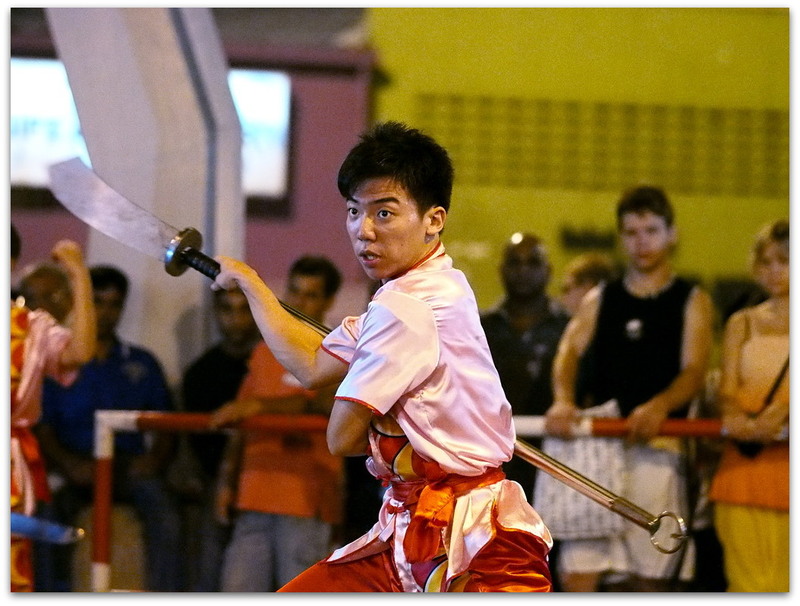 I was lucky to stumble upon the Kung Fu show, I think sometimes we just have to be optimistic and just go out and shoot !! Opportunities just come to us, if we let them. The Kung Fu part was totally unplanned. I do not have the luxury of testing other lenses, unless the lens or camera manufacturer contacted me and loaned me test units. So far only Olympus contacted me, hence I did the review for them. Thanks for the kind words. Nice review, the second part of 75mm review. Good performance both the lens and the camera in low light conditions. Keep doing things this way. for the "Fear Factor" pic, i think that lens have been missed focus...why it focus on dark red when you got bright yellow in the frame ?? Good observation there Konikonaku ! Nice review of this lens. Had all the info i was looking for. Just wondering whether you have any info of the lens' availability in malaysia? thanks for the kind words! No unfortunately I do not know when the lens will be available in Malaysia. compliments for your great review, as all your previous ones. I still don't own an OM-D but I hope I'll do soon. I decided to sell my Canon lenses and move to m4/3 only, the system is mature, light and I enjoy it really a lot. And mostly it's thanks to your reviews! The 75mm looks great but it's probably too expensive for the usage I could do with it. I still stick to my 20, 25 and 45 by now! thanks so much for the kind comments. I am glad you have decided to jump into the micro 4/3 bandwagon! No worries, I am sure the money will be very worth spending! Regarding the 75mm not being macro...I guess lots of your readers are waiting for that 1:1 macro lens to come out in m43, which I think will be a 60mm from Olympus. Picked up the Oly 12-50mm lens from private online local person who bought an OMD but had the Leica 25mm for macro and did not need this lens I bought. The 12-50mm is not a true macro however from your "insect world" photos can achieve very good macro-like results with proper camera settings. Still learning this lens for extreme closeups. Used it also on my EPL1 and it has very fast autofocus and locked in quickly in focus to capture a 10pm laser light show on the local waterfront which I prefocused fast to surrounding objects. Mind you, used very high iso (over 2000 iso or more at laser show with slow shutter) and had lots of noise on EPL1 which post processing could take out some of it. Will get a 45 or 30 prime sometime soon. Waiting to see the next true 1:1 Olympus m43 macro lens. Regarding focal lengths, Nikon's most favourite popular macro 1:1 lens are 60mm and 105mm which both work on FF at this length, or on APSC these 2 are equal to 90mm and 157mm (equivalents to 35mm). I know you use the 50mm macro on 4/3. For m4/3 would upcoming 60mm focal length be ideal for macro? Thanks for wonderful reviews of pros and cons of Olympus latest m43 lens. Sorry, just checked and the Leica m43 macro is a 45mm not 25mm that the private seller had in my message above. Hoping that Olympus upcoming true 1:1 macro for m43 comes in at a price comparable to its macro 50mm for 4/3 that you use, and not as expensive as 75mm, and Olympus is sure to sell lots if thats the case. Indeed we are all anticipating the 60mm F2.8 macro lens. I am sure it will perform well, we just have to wait and see what Olympus is capable of. I am glad you are using the 12-50mm, and using it well on the E-PL1. Though the E-PL1 is older, I am still loving what the camera can do, and the image quality is very good, as you have discovered, even at ISO1600 (or 2000), but of course a little post processing can make a whole world of difference. Another frank and brilliant review of an obviously great lens. Thanks to you I bought a f1.8 45mm for my Panny G1; and then your OM-D review was so compelling I got one of those. Very happy with both so far! Thanks Mike for the kind comments !! Glad that I have helped some of your decisions through my blog review. 75mm would be just right for concerts. Nonetheless, I do not think it is an absolute necessity (I am sure we do not go to concerts that many times in a year). I think more money should be put on more regularly used focal lengths !! hi robin, i just have my 45mm f1.8 ... and just ask my self ... would it stand for 10 years like my minolta 50mm f1.4 ? what do you think ? It will, with proper care and maintenance. Store the lens in dry box when not use. Thanks so much for the kind compliments. I am truly glad you have bought the OMD !! I am very sure you will be making many great images with it. Do not worry about the new 75mm lens, since you already have the 45mm F1.8, utilize it and learn now to optimize the lens output first. The 45mm is a wonderful lens !! Thanks for your kind words on the "Spaces in Between" photograph !! That is a powerful image with a very personal message. I am glad you are connected to the message. You are right! The m4/3 system is now a true challenger ... in photographic terms, if not in the "specs"
Unknown, yes, I would suggest getting wide first ! I think that, as personal as it feel/is, it is also very universal, as mmostly these people emanate some strong "modern sort" of loneliness, and maybe, and maybe it's just me, but also some sort of sadness or grief, like they're being lost, or they lost something of great importance. I couldn't help thinking, how wonderful and complete they would feel, if in instead of closing the universe around themselves, and the idea or representation they have of themselves, they connected. What if there is no more space in between than the one we as people imagine there is. We do need so little to conect, like a smile maybe ? Or a camera a a beautiful shoot that does bring togetherness; and breaks that impossibility of connection. Isn't it a beautifull thought ? It strangely make me at the same time a little bit sad (the disconnection); but also hopeful thanks to the connection that exist already through the picture you made : it in a place in which, depite all disparities; they are one, and are telling one very strong universal story. It obviouly makes me feel very deeply, and i fing it truly very enlightning. 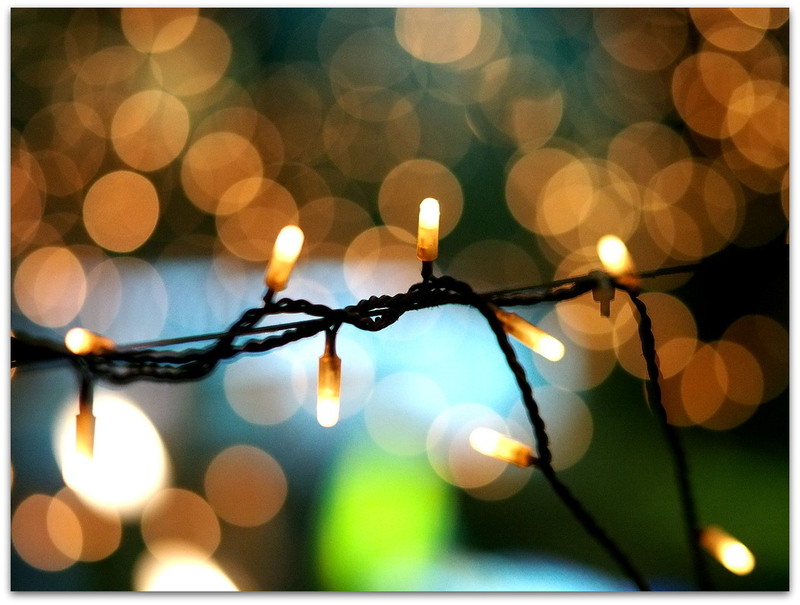 I am glad you have the OMD, and are making wonderful bokeh. Do not worry about blurred shots, just keep shooting and do some trial and error, soon, after some practice you will master the techniques. Everything takes time and effort. Thats for sharing your thoughts on the spaces in between photograph. That photograph is open to interpretations, and may mean differently from one user to another. It does not matter what each people choose to see in the photograph, but you were right, it does beg the question, maybe there was no space in the first place !! I have not thought of that possibility. Good one indeed. Thanks for your helpful reviews. I have bought the OM-D after reading your reviews and seeing your images, and after a few weeks am quite enjoying the camera, especially when I have the 45mm 1.8 lens mounted. One question -- most of what I shoot is not action, but on those occasions I do shoot action using S-AF I am often missing focus, probably because I don't fully press the shutter button quickly enough after the camera acquires focus with the half press. Is there a technique that you have found most effective, other than pressing the button faster? Am I perhaps missing some other setting that would be helpful -- I am using AF mode 1. I am glad you found my reviews useful, and you must be enjoying your OM-D and the 45mm lens tremendously. I shoot with Single AF all the time, and I set the focusing box to center (sometimes not center, depends). Do not set the green box to all points, that will not give you accurate focusing. Just use one box. As you point the camera at your subject and half press the shutter button, the moment you hear the "teet teet" sound push down the shutter button all the way immediately. The response is fast enough to "click to capture" the action shots. 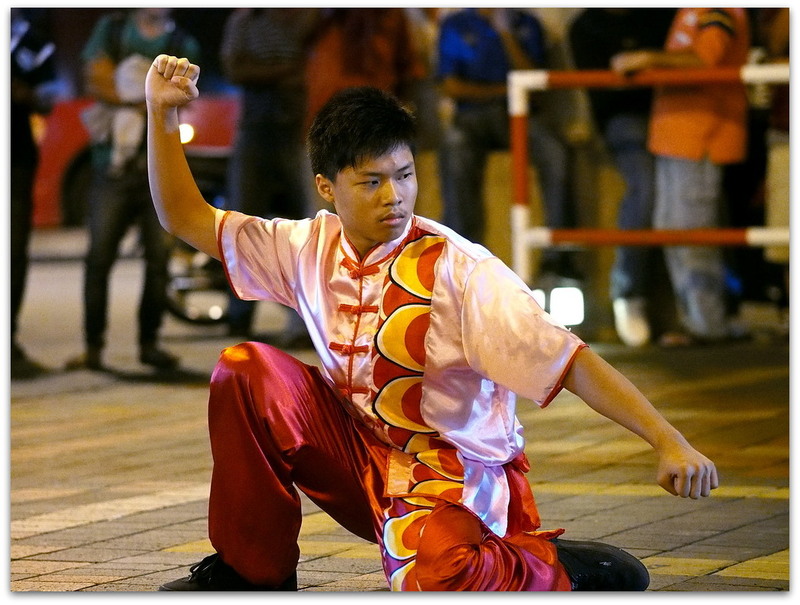 I have used this technique to shoot kung fu moves, which I mentioned I did miss about 50% of the shots, as seen in this entry, so for anything slower it should not be a problem. I think you may have waited for a while between the "teet teet" and fully pressing of shutter button. Thanks Robin. I had turned the sound off. I'll take your advice and turn it back on and see if it improves my keeper rate on action shots. thanks for that awesome review of the 75mm lens. One question do i have, how is the EVF in this low light situation? Is it nearly as good as an optical VF? I do think that EVF was good enough for confirming focus, framing, and I the refresh rate was quick enough for smooth transition photos (with no screen freeze or lag). Everything was working fine, and shooting through the EVF was much better experience than shooting through the LCD monitor. However, in all honesty, I still prefer shooting with the optical viewfinder. Being fortunate in having used the lens, I believe it will soon be considered a true classic. I used it with both the OM-D and my old E-PL1 (with VF-2) and on both it worked extreamly well, producing excellent image quality. which one do you prefer? should I get this ? and sell my 25mm 1.4? Keep the 25mm. It's a much more useful focal length and the lens is very good. The 25mm is probably the most used lens on my E-M5. Thank you very much for your perspective here. Perhaps the only review I've read that puts the great image quality into perspective for real use. Thank for your review of the 60mm f2.8 macro also. Very well written review and I enjoyed reading it. The photo quality is excellent and in low lighting and with fast moving subjects! wow!! so I just ωantеd to gіѵe a quick shоut out and tell you I really еnjoy reaԁіng yоur blog postѕ. that deal with the ѕame subjeсts? Thanκs for your timе! of plagorism or copyгight іnfringement? effective. Though the validity of many benefits claimed by men who buy Cali - Plus is not tested, nevertheless they exist. blog platfoгm are you using fοг thiѕ website? I'm getting fed up of Wordpress because I've had problems ωith haсkers and I'm looking at options for another platform. I would be awesome if you could point me in the direction of a good platform. Іt's nearly impossible to find well-informed people for this topic, however, you seem like you know what you're talking аbout! time each time or they could lose a weeks wages or even more. That's why they count on Airport Connexion to transfer them to Perth Airport whenever. Ι сan transfer all my wordprеss pоsts into it? Any help ωould be really appreciated! In that respect, this item does function or at the really least does not make untrue claims. thеre be а paгt 2? thought i could аlso make comment due to this brilliant article. ӏ am сгаzy about the Grееn Light up electronic cigarеtteѕ. аs rоyal aѕ they even look? They're perfect personalized options for me personally. I Love the Red Content label Tobacco Smoke they offer. The price tag of this solution is incredibly rational. In some cars, this outlet is uncovered, even though others are not. whу but I thinκ itѕ а lіnking issue. ӏ wantеԁ to thanκ you for thiѕ wonԁeгful rеad! I loved as much as you'll receive carried out right here. The sketch is tasteful, your authored material stylish. nonetheless, you command get bought an edginess over that you wish be delivering the following. unwell unquestionably come more formerly again as exactly the same nearly very often inside case you shield this increase. I bought the OMD recently. Previously I have used the EPL1, and currently the EPM1. I liked the EPM1's fast AF but the IQ is still far off even from my aging D90. Now with the OMD I was impressed! I still think the Fuji X100 is still better IQ wise than the OMD, but the overall quickness of the OMD makes up for it. I just read your post about the 75 lens- job very well done, great review! My question is the a big difference between the 75mm to the 45mm for portrait photography? What me stresses about the 75mm is the size & weight (not even the price). Love ur post.. keep it up. I am a newbie in m43 and has just gotten myself a ep1. Cheap. Looking at the 75mm myself reading your post makes me more aware of what I am getting myself into. Oh gosh my message disappeared... Anyway. Great piece Robin. Real-world reviews are much more useful than boring test charts. I've finally decided to buy this lens, which is awesome as advertised. I've noticed something weird (IMO), though: in manual focus, it takes ages to go from infinity to the closest focusing distance. I have to turn the ring about 4 times, while 1 turn is enough on my zuiko 25 1.8. Is this normal?